Update: We still believe the Fluke 87v is the best digital multimeter for most people. See our complete review below. 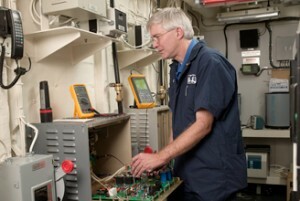 Fluke is the undeniable leader in the electronic test tools market. Since 1948 they have been developing products to help manufacturing and service industries test and troubleshoot their technology. Based in my home state, the Everett, WA company makes a wide range of testing tools including the popular Fluke 87-V digital multimeter. This is a True-RMS meter that delivers exactly what it promises. The 87-V has auto and manual ranging capabilities which allows it to be used in a variety of situations. You can even measure up to 10 A and 20 A for a maximum of 30 seconds. Many professionals choose the Fluke 87-V over other inexpensive brands for one reason: reliability. If your job depends on accurate readings and measurements, you don’t want to risk your career by using an inferior multimeter. The icing on the cake is that it is designed and built in the USA – so you know it’s high quality. If that wasn’t enough, Fluke products are backed by their Lifetime Warranty and always include their famous customer service to boot. When you purchase the 87-V you have many advantages over other digital multimeters. One main benefit is that you can take accurate temperature readings right out of the box – no need to buy a separate thermometer. Another benefit that only comes with Fluke multimeters is the ability to take voltage and frequency measurements on adjustable speed motor drives. This was completely unheard of until Fluke blazed the trail ahead of its competitors. Now you too can have this same capability in your hands while out on the job. While most digital multimeters will give you similar readings, they are useless if you can’t easily read the results on the screen. This model has a large digit display and a two-level backlight. Give your eyes a break, and get a tool that will make your job easier, not harder. 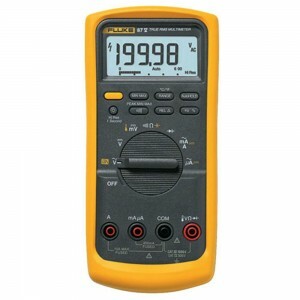 When comparing this model to other digital multimeters, the price is definitely noticeable. But, all the other budget meters are a waste of your money.